If there's a productivity app that could have possibly gotten by without immediate shortcuts support, it's Things. My reasoning is that, even before shortcuts came along, Things already had strong features in the areas of Siri and automation that most other apps don't. Last year Things adopted SiriKit intents to enable full Siri support for task creation, list viewing, and more; it has also long had built-in actions in Workflow, which are now carrying over to the Shortcuts app. Even if the team at Cultured Code hadn't written any new code this summer, Things would have still included strong Siri support and integration with the Shortcuts app – what more could a user ask for? Fortunately, I'm glad Cultured Code recognized that users can and do ask for a lot more, and they've answered that request. Continuing its reputation for day one adoption of major OS features, Things includes a variety of shortcut options that put fine-grained automation tools in the hands of its users. As Federico shared in the Shortcuts chapter of his iOS 12 review, Apple has designed shortcuts to be system-generated based on actions you regularly take. For example, if you tend to open the Today view in Things every day at 9:00am, iOS will recognize that habit and begin suggesting the option as a shortcut that can save you a step or two. But as is true with other systems that work invisibly and take configuration out of users' hands, sometimes things would be easier if you could still take care of certain setup options yourself. That's why I appreciate what Cultured Code and other developers have done in providing shortcut creation tools inside their apps' settings screens. In Things, visiting Settings ⇾ Siri & Shortcuts presents the option to configure shortcuts in two categories: Add To-Do and Show List. These options may seem simple and overly limited, but fortunately Things provides a wealth of depth behind each one. Under the banner of 'Add To-Do', shortcuts enable creating new to-dos that are either saved in the background without opening Things at all, or that will serve as a new task template of sorts. Tasks created in the background need to have all their details pre-set ahead of time, with one exception. Template shortcuts, on the other hand, will pre-fill certain parameters of a task, such as default tags and lists, while leaving other things like the task's title blank and asking you to fill them in when the shortcut runs. One of the neat power features Things offers is the ability to use the clipboard as input for 'Add To-Do' shortcuts. Clipboard import is available for Title, Notes, and Checklist sections, meaning that even with shortcuts which run entirely in the background, the clipboard enables creating to-dos that vary each time the shortcut is run, rather than being limited to an entirely pre-determined to-do for background shortcuts. 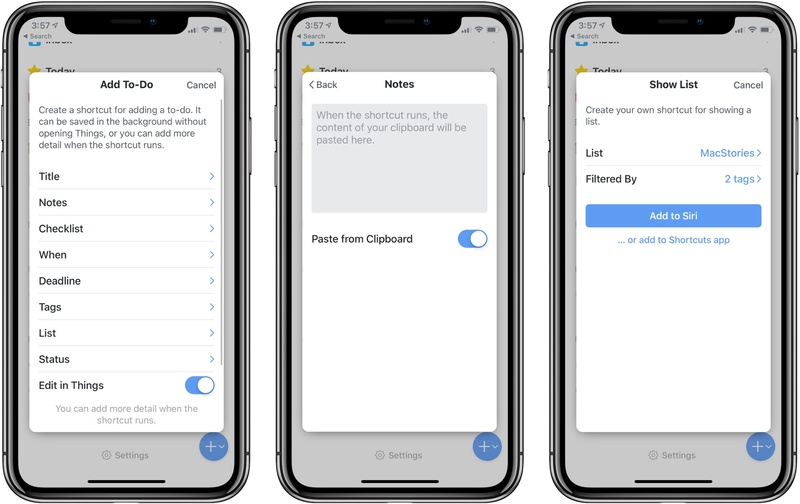 When it comes to Things' 'Paste from Clipboard' option for shortcuts, there are a couple nice details worth mentioning: if your shortcut uses the clipboard to fill a Checklist, separate lines copied to the clipboard will paste to your new to-do as separate checklist items; also, shortcuts that employ the clipboard for both Title and Notes fields will have the first copied line used as the task's title, while everything below that line will go under Notes. For my personal uses, both of these options are great when paired with Apple Notes. I'll often jot down a quick list of to-dos in Apple's app that I later wish was in my task manager, and shortcuts make that transfer extremely easy. Similarly, if I take notes on a topic that later needs to be made into a task, a quick ⌘A then ⌘C, followed by running a shortcut, will give me the new task I need along with all relevant information saved in the Notes field. Outside of creating new tasks, Things' second main category of shortcut types involves loading specific list views. You can create a shortcut that shows you a particular list, such as Today, Someday, or one of your areas or projects, and that list can be filtered by tag so that you only see the exact to-dos you need at that moment. Because of the tag filtering feature, this shortcut option resembles a saved search: if you often want to jump to viewing only tasks from a certain project that contain a couple specific tags, you can create that shortcut and access it from something like the Shortcuts app's widget, thus saving you a few steps in finding those tasks each time. While I've enjoyed trying out Things' shortcut options, there's one major issue I've run up against: because Things comes in separate iPhone and iPad versions rather than being a universal app, the shortcuts you create on one platform won't transfer to the other. Instead, you'll need to set up each of your shortcuts twice, once on iPhone and once on iPad. Also, since the system sees iPhone and iPad versions of Things as two separate apps, it will have a harder time tracking your behavior and suggesting relevant shortcuts in places like Search and the lock screen. If, for example, you open your Upcoming view every day around 5:00pm to get a peek at tomorrow's work, iOS will only know that if you consistently perform the action on the same device; if you bounce back and forth between iPhone and iPad, your habit will be lost on the system. If nearly all of your task management is done on a single device, Things' shortcomings in this area won't be an issue for you. But if like me you frequently employ both iPhone and iPad with Things, this limitation is something to be aware of. Siri face integration on Apple Watch. Things can now add content to the Siri face in watchOS, though it's not quite in the way I expected. The Siri face is all about providing you with relevant information throughout the day, so I expected that if, for example, I had one task due at 11:00am and another due at 4:00pm, those times would be displayed on the Watch and would be sorted as separate cards into the appropriate spots of the watch face. That's how Reminders has worked since it debuted on the Siri face last year. 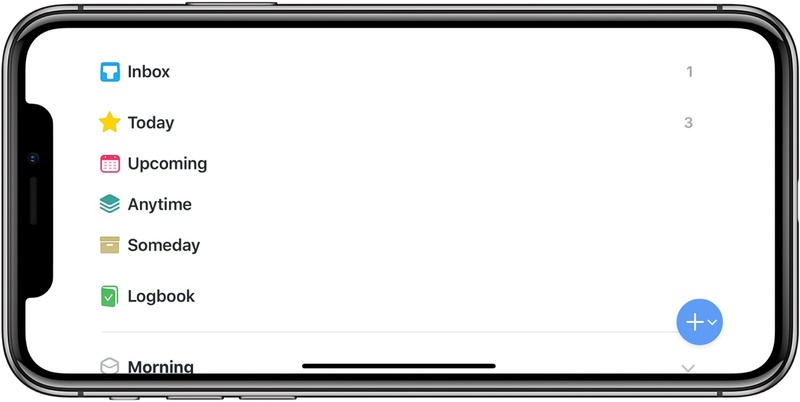 Instead, Things keeps it a lot more simple: the app provides a single card on the Siri face, which will display the title of the first task in your Today list, along with a count of how many other tasks are due today. I understand the appeal of this approach, since not everyone wants to see all their tasks on their wrist, but I would have at least appreciated the option to have more cards spread throughout the day as needed. Landscape support on iPhone. Just in time for the launch of new iPhones later this week, Things is adding support for landscape mode on iPhone. I'm not a big landscape iPhone user personally, but if you are, you'll be happy to find that your task management duties can be handled in any orientation. Dynamic notifications. Notifications are seeing a big upgrade in iOS this year, with the ability to offer dynamic responses based on user input. What this means specifically for Things is that when one of your tasks becomes due, the previous option on its notification to Snooze now comes with a set of options. Instead of just hitting Snooze and wondering when the task will reappear, now that button press will expand the Snooze option into three new buttons: Snooze for 10 minutes, for 30 minutes, or for 1 hour. Password AutoFill adoption. Cultured Code has adopted Apple's best practices for Password AutoFill, so whether you're changing your password for Things Cloud, or setting up a new account altogether, the process is entirely pain-free. Cultured Code should be applauded for its strong history of supporting new OS features on day one. It's great being able to depend on an app to always take advantage of Apple's latest initiatives, and that level of reliability is certainly true of Things. Overall, Things 3.7 is a strong update, albeit marred by shortcuts being unable to sync between device versions, and a limited Siri face integration. Nonetheless, there's a lot to like here: shortcut setup is made simple and easy thanks to Things' 'Siri & Shortcuts' screen, and improvements to notifications are appreciated, as is the newly-offered landscape support. The changes may not bring in new customers, but they should satisfy existing users. Things 3.7 for iPhone and iPad is available on the App Store.